Downright Dead by Pamela Kopfler is the second book of the A B&B Spirits Mystery series. This series is a paranormal cozy mystery series with a main character determined to solve crime with the help of a resident ghost in her B&B. Holly Davis wasn’t too happy when her ex husband Burl began to haunt her B&B after his death but who knew that a ghost was just what business needed. A ghost chasing TV crew did a show on the B&B and business was booming but unfortunately for Holly Burl crossed over after his death was solved. Now Holly is doing whatever she can to pretend there’s still a ghost at Holly Grove to keep the business coming in. 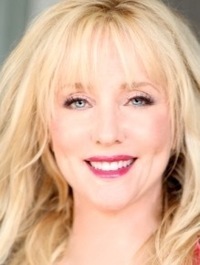 The last thing Holly needed however was the television crew to want to come back when a debunker makes the claim they faked the show but with a clause in her contract Holly can’t do anything but invite them all back to film again and finds herself yet again trying to solve a murder when things get out of hand. 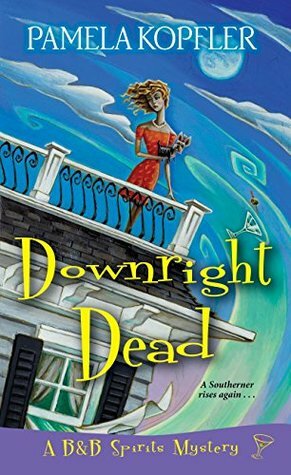 Downright Dead was a great follow up to the first book in the series as far as bringing back the likable characters with a bit of humor mixed into a mystery. I would say this one was rather slow going though in getting to the mystery side but the haunted/unhaunted B&B story line was plenty to stay entertained with until the murder came along. I’ll definitely be looking forward to more spooky hijinks to come from the series. Pamela Kopfler was born a Texan and tumbled through twelve schools all over the U.S. before she finished high school, but she’s a Southerner—through and through. Now, she calls South Louisiana her home and writing her passion. When not spinning her next tale, she enjoys reading, weight training, traveling, target shooting, hiking, gardening, painting, and dining at dives to five-star restaurants. Visit her at http://www.pamelakopfler.com. Paranormal cozies are definitely growing on me Carrie. Your review is well done and has convinced me to read this series. I like when there is a story besides just the mystery.